The Skinny: Extremely broad comedy from Tsui Hark and Cinema City can be a funny, though trying, experience for some. Your possible enjoyment depends on your ability to tolerate extreme silliness. 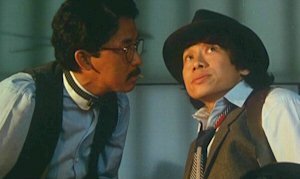 Set in 1930, this zany comedy from Tsui Hark and his Cinema City cronies is creative and eager-to-please, which doesn't always mean great things. Godfather Capone (Karl Maka, playing off his cueball skull) is out for a huge score, but he despises a mild-mannered P.I. named Champ (George Lam). Champ was responsible for Capone's prior incarceration, so he begins his revenge by sending zany killer Eric Tsang after him. Meanwhile, Champ gets an assist from Police Chief Robin (Teddy Robin). Hijinks ensue. The manic energy from director Tsui and his cast can prove entertaining, as it immediately glosses over whatever failed jokes occur. Still, there are a lot of failed jokes hereas well as some genuinely funny ones. Those who like wacky slapstick should be engaged, but the nonsensical silliness of this film (and other Cinema City films) is not for everyone. To be honest, the experience was a mixed one for me, as I found myself saying, "What the--?" far too often.